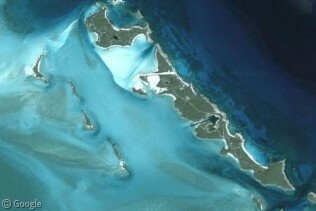 Who wouldn’t want their own private island in which to wall themselves off from the rest of the world, while enjoying all the comforts of wealth and opulence? After all, celebrities do it all the time (some even build Stonehenge replicas and issue their own island currencies in increments of Pi). 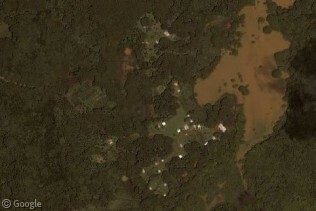 Thanks to Google Maps, we can get a glimpse of some of these water-bound estates and see how the other half live. The stereotype associated with private islands is a tropical paradise in the middle of the ocean covered in palm trees and rimmed by white sand beaches. 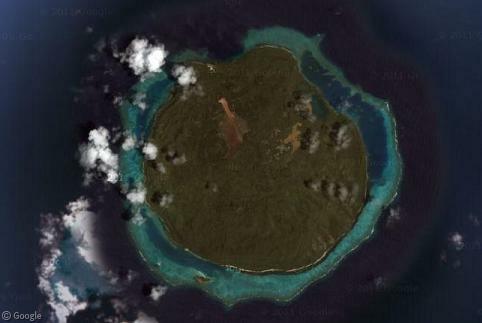 Perhaps nothing meets that stereotype more than the Polynesian atoll of Tetiaroa, which was purchased by Marlon Brando in the 1960s for US$270,000 while scouting locations for Mutiny on the Bounty. 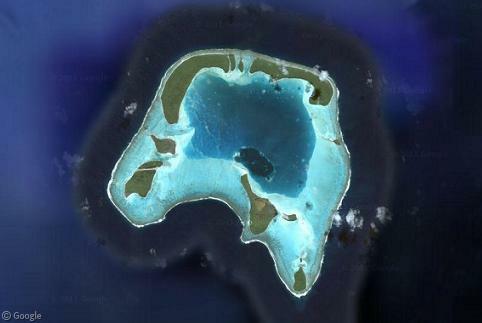 Brando’s goal was to turn the atoll into an eco-luxury resort, but there are surprisingly few amenities or buildings (even the air strip is rather plain). 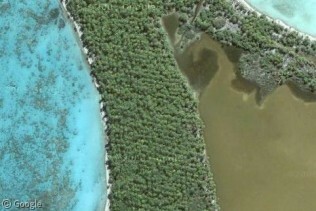 Prior to Brando, the atoll was used as a copra plantation, and the planted rows of Coconut palms are still quite visible. Next stop is Fiji and Mago Island was bought in 2005 by Mel Gibson. Gibson also inherited an entire village when he bought the island, which is home to the island’s caretakers. 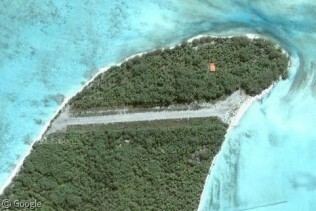 The island has been left untouched for the most part other than the scar left by an airstrip. Perhaps the king of islomania1 is Virgin gazillionaire Sir Richard Branson, who boasts three islands to his name: Necker and Mosquito in the British Virgin Islands (his own private resort and an ecotourism project, respectively), and Makepeace Island in Queensland, which is currently being turned into a private resort for Virgin employees. 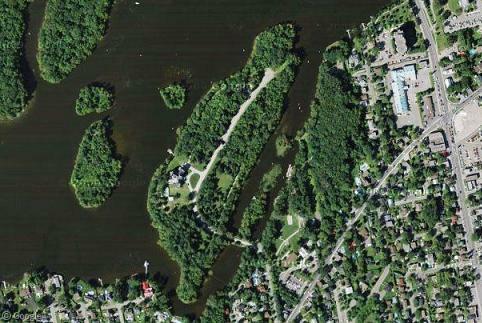 Some celebrities eschew the tropics for a private piece of land in their own backyards, such as Celine Dion, whose mansion sits on Île Gagnon in the Rivière des Mille Îles at Laval, Quebec. The island’s mansion and swimming pool are clearly seen here but Street View can only get as far as the estate gates (which one must assume were put in place as sound insulation by Lavallois tired of hearing that bloody Titanic song). 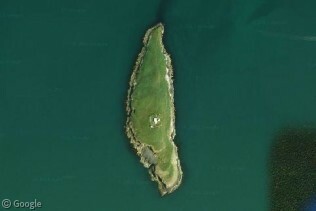 True to type, adventurer/TV presenter Bear Grylls went with something a little more rudimentary, purchasing the treeless Welsh island of St. Tudwal’s Island West, which is home to not much more than a simple lighthouse and a stone cottage. The island’s cliffs are probably well-suited to a man who climbed Everest at age 23. Of course that’s just scratching the surface of celebrity-owned islands. 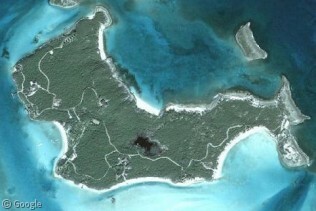 Do you know of any other private islands of the rich and famous on Google Maps? Let us know about them in the comments!